Irkut mc 21-300 has cabin length of 1108in. With that in mind, if Irkut changes it’s mind and put two type A exit doors instead of four type c, then they can put 234 seats 28in seat pitch with exit door configuration like on the 767-200, perfect 767-200, 757-200 or a321 replacement. Then they can put act-s additional center tanks like on A321LR and have 36000 liters of fuel like on the future a321xlr. That would make Irkut mc-21, NMA killer with range of 7000-8000km. Thrust might be problem with 100 ton MTOW. MC 21-400 would be perfect replacement for 767-300,757-300 with similar exit door configuration like on 767-300(Type a, Type III,Type III, Type a=280 to 300 exit limit) and cabin configuration of 270 passengers in 28in seat pitch configuration. The -300 is still shorter than a 321 and has the T/O weight of a 320. It is nowhere near competing in the so-far-non-existent MoM market, much less replacing the 767. Maybe the cabin width would make it a good candidate for stretch into the 250 seat range, but that would take redesigned wings and new engines. It is a good competitor for the 320/737, provided reliability and after-sale service can keep up, which has been the Achille's heel of Russian airliners so far. Pretty sure he refers to the - 400, which seems to have disappeared from the radar, or English Wikipedia at least. Let me explain you guys. 2. 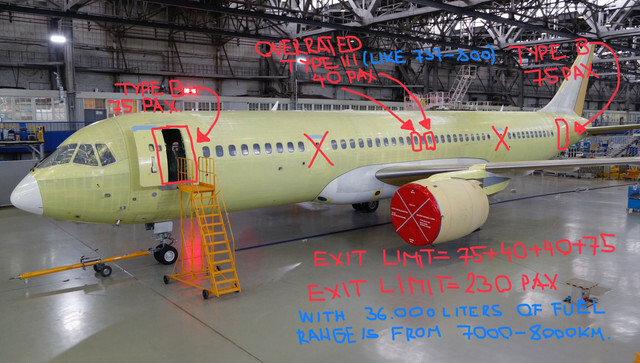 Changed emergency doors equals MC-21-300 has more cabin space for 234 passengers. 3. Higher Maximum Take-off Weight equals more powerful engines like Airbus did with a321. 4. Additional center tanks equals more range. There is 767,757 replacement for sectors of 7000-8000km. Don’t understand why you don’t understand what is difference between emergency exit doors, but Mc 21 with similar emergency exit configuration like Boeing 767 200 can handle 234 passengers, which makes it perfect replacement. If you don’t understand my post, please ask me for more explanation. Guys you can put 234 passengers in mc21-300 no changes made except emergency doors. 400 version with emergency exits like 767 300 can handle 270 passengers which makes it perfect replacement for 767-300, nobody talked about starch of the fuselage or Wikipedia. Please don’t be provocative. You are completely wrong there. There's much more to MTOW than just a thrust. Landing gear, wingbox structure, wing (area, aspect ratio etc. ), mass distribution. And sure, additional tank gives extra range. And extra weight. MC21 is built to directly compete to A320 family (200 against 320, 300 against 321), but is still hardly matching them (less fuel, less thrust, similar wingspan). If enlarged, it might have similar range and payload to a321. But now, it's nowhere to that, pure speculation, and an expensive one, since it's an expensive development. Sorry, I don't see that as well. Production is starting in 2018, certification slipped to late 2019 and the first delivery to 2020. Its early production rate is projected for 20 aircraft per year. within five years UAC plan to ramp up production to 70 aircraft per year. It COULD be a decent plane but with the certification drifting sideways and the low production numbers it could be 7-8 years before the first 50 are delivered. That’s what Airbus has done for years, and it’s still doing!!! That's exatly my point. It's not "it can't be done". It's a "expensive process, that takes years to complete". It took Airbus some 5000 sold units, and about 25 years to make neo LR. How long will it take in this case? And how does it compare to NMA schedule (first unit in 2025, IIRC), not talking about 321NeoLR or XR (first available now with delivery in probably 2-3 years, other will probably be available long before NMA anyways)? I'm not telling it can't be done. I'm telling it will not be done, for two simple reasons: too expensive and too long to deliver. Plus all the problems we learned from SSJ-100. Which could be the case for "it alread happened" case. Perfect match for Ejets and CRJs, perhaps even better, but low resales value and failure to deliver on maintenance killed all contracts abroad Russia. So, that's only your dream. It's your choice to accept or dream, but that's not gonna happen. Period. The most interesting will be when OEW will be announced. Based on the declared range, OEW should be about 44t for the -300 model, which is the same as for the a320neo. It's hard to believe. Low MTOW is a mark of technological backwardness of Russia's aviation industry. I do not think that the empty -300 weighs much less than MAX9, while the difference in MTOW is more than 10 tons. Even with a range of 6000 km with 163 passengers, аt maximum capacity the range of -300 should be 4000 km. Even with low MTOW with 228 or 234 passengers, Pobeda can fly to every destination in Europe. But with bigger MTOW 100ton version, MC-21 would be one aircraft that can do everything that Russian lcc airline needs. I'm not sure how you can fit 234 pax in a -300. It's over 2 metres shorter than a 321, and while the cabin is slightly wider, it's still a 6 abreast aircraft. Sorry, but as it stands, it is not an airplane the metrics of which would allow it to compete outside the 320/737 class. It simply was not designed to do so. Maybe the fabled -400 could out-load the 321, but I suspect the range would take a hit, and no one really knows how much weight that wing is designed to handle. It would have to be capable of 100T+. It took Airbus some 5000 sold units, and about 25 years to make neo LR. And they didn't even redesign the wing, they just tweaked the current airframe to the very edge of what technology would allow them to. There's global support, financing, reliability, insurance rates, leasing options, etc, etc. All fields in which A and B have light years worth of head start. I still wish the MC-21 well. I'm sure it'll be a fine airplane. Russian, Chinese and, for that matter, Japanese airliners are unblemished by success. The current entries may prove that rule, but somehow I doubt it. There’s a whole lot more to an airliner than a certified plane. Yes, I know about the YS-11, even flew on a Piedmont one, but 182 planes is not a success. Honestly politics beside tehinical specifications and advantages play major role. It’s probably going to be copy paste situation like with superjet. Superjet in the end is success, but it’s not all about money. Chinese and Russians are more about national pride. It’s not politics, it’s support, financing, reputation. Look at the Superjet support issues, the Indonesian Demo accident. Name an insurer who would rate a Superjet the same as a Boeing/Airbus or a lessor. Then, go back to actual performance which rarely meets current designs from A and B. How is Superjet a success with 170-ish deliveries in 11 years? In the political climate as Russia is today. Superjet is success. Yeah, for a couple of reasons, main being trying to fit C size stand. Don't get me wrong, but the reason for argument was: if you sold a couple of thousand units, you are more eager to develop derivatives. Tools and design costs already paid (or to be paid soon enough), and any modification for smaller market is gonna make you earn more. In case of a plane where you sold 150, or 200 units, you're still in the woods. Plane has not paid itself, nor tooling. The past thing you do then is to look for another design, that would raise your sales marginally, most likely. Even if it managed to match, or exceed NeoLR, it would take 4 years to design and prove it's worth the money. 321NeoLR is already there, NMA comes in what? 7 years? Probably being a size bigger (D class) and much more capable. With all the experience behind (Boeing delivers the promise in most cases). Again, I must say there's no case for that plane. Not at this time. If they manage to sell 200+ units od 21-300 and there's still market for these planes, then it could be the time to start work. No sooner. Don't get me wrong, but the reason for argument was: if you sold a couple of thousand units, you are more eager to develop derivatives. I certainly wasn't arguing with that. On the contrary, merely emphasizing the point against the OP's hypothesis of a possible MC-21 NMA contender. Although, on paper, they aren't too far from 200 orders. I would agree that 200 up to probably 400 units is going to be sold, 500 if they are really lucky. But 4 months, 47 flights and 149h of test flight is needed for certification of A321LR version. That’s mind blowing, with changed exit doors, range of 7000 to 8000km and 228 or 234 passengers Mc-21-300 could be good contender to A321LR or new NMA. Yes I agree 234 seats is not enough but still makes it contender. Less doors more space (234-228 seats 28in seat pitch) on the Mc 21-300. Bigger MTOW and more ACT’s (additional center tanks) more range. Understand??? 1. Regarding your proposed exit door arrangement- Structure-wise will two Type B exits even work that far back on the fuselage without a major redesign of that section? Upgrading the X'd out exits forward of the proposed ones to Type B standard would seem to be a much easier option. Also, is having two Type III exits that close together over the wing acceptable on new designs or is it something that is only grandfathered in on existing designs such as the 737? 2. Regarding additional center tanks- Space on any aircraft is finite and extra fuel tanks would steal available cargo/luggage space. Since the MC-21 300 doesn't appear to have a very deep fuselage, can it spare the luggage space that will be taken up by additional fuel tanks, particularly for proposed long-haul flights? 1. Look at Airbus what they did with A321neo cabin flex. They redesigned exits and put 10 more passengers in aircraft. Yes reinforcements would require more investment, new doors would require more reinforcements and modifications. But that was what Airbus is doing with a320 for last 30 years and they are most successful single aisle manufacturer today. But with political climate in which Russia is today, there’s no real reason for any reinforcement change or modification to design because western countries are not going to buy that jet, or even big ULCC’s. It’s going to be exclusively Russian market with couple of Asian and African countries. Might be some South American or Chinese but all in all even if it is most superior single aisle in its class, we will see Superjet 100 story repeating itself again. Even if you want to buy, you can’t because of western countries political pressure. My concern regarding remaining luggage space after the addition of ACTs on the MC-21 is this: The A320/321 has a deeper fuselage and larger cargo bays than a 737 and thus loses a smaller percentage of available space to ACTs, whereas the MC-21 fuselage appears to be no deeper if not actually slightly shallower than a 737. Take cargo hold volume of any airplane, then multiply number of seats by the volume of biggest pice of luggage available. Then when you calculate all of that luggage minus cargo hold volume and you will see that there’s more then enough space for act. Anyway, people really don’t understand point of this topic so all of this time that I lost explaining was pure waste of time. People don’t understand and care about regulations and frankly they don’t care about new possibilities with airliners generally. I made mistake, people on this forum are generally more towards enthusiasm then professionalism which should be always taken in mind. Anyway, people really don’t understand point of this topic so all of this time that I lost explaining was pure waste of time. People don’t understand and care about regulations and frankly they don’t care about new possibilities with airliners generally. I made mistake, people on this forum are generally more towards enthusiasm then professionalism which should be always taken in mind. All you're saying is that the MC-21 could get the A321neoLR treatment with the cabin flex option. So it could.... maybe. It depends on whether they could push the whole thing to 95-100T with the current wing, and no one really knows. So far all we see is a A321 / Max 9 sized airplane with the MTOW of a A320 / Max 8. Interesting proposition, but nowhere near the imaginary LR or Max 10 competitor you're pulling out of your hat. Why would anybody care about 300-800 airliners and most probably 500 if we look at world politics today. So any change to that aircraft is probably not going to happen. Honesty I would only certify 300 version and wouldn’t do any modification or new version. MSN 21003 just joined the test flights this week, apparently all the mods. made to MSN21001 have been replicated. Also final assembly for MSN 21004 is almost ready, should be flying by the end of year. One thing they are going to have to do is re-designate the MS-21. The 'C', is the Cyrillic 'S'. If they can't even come up with an alpha-numeric designation that works in the west, it's not likely that the plane would ever work in the west either...not that it is likely to happen anyway. The Russians can design aircraft as well as anybody...but design is just one aspect of a successful product. For one thing, hey have yet to produce an airliner at rates much greater than 20 per year...which is about 2 weeks production of the 320 and 737. Add to that reliability, quality control, service and logistics issues, and the likelihood of any Russian airliner competing in any meaningful way to Airbus and Boeing products is pretty much nil. This is coming from a guy who likes Russian aircraft and has flown on the Tu-154 and Tu-134...and almost flew on a Yak-42...if it didn't go mech. The MS-21 may very well be a very good aircraft, but it will never be a competitive one.